Researchers in Italy and the UK have developed a new system for turning human embryonic stem cells or induced pluripotent stem (iPS) cells into a type of brain cell affected by Huntington’s disease. By studying how the brain cells develop in nature, the researchers learned how to guide the stem cells to produce just these brain cells in a dish. We caught key members of the research team on camera explaining their new results. Huntington’s disease is an inherited, degenerative brain disorder for which there is currently no treatment. A fault in a particular gene causes certain nerve cells in the brain to be damaged and patients experience gradually worsening physical, mental and emotional changes. Among the first cells to be damaged in Huntington’s disease are ‘medium-sized spiny neurons’, nerve cells found in a part of the brain called the striatum. 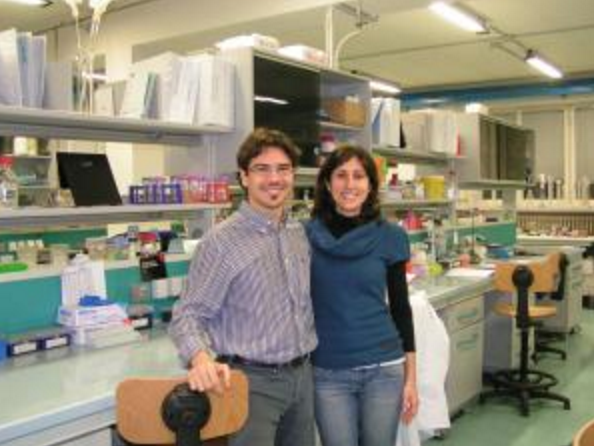 In research published in the scientific journal Development on 18th December 2012, a collaborative team from Milan, Cardiff, Cambridge and Pavia describe their new method for growing these nerve cells in the lab from human embryonic stem cells or iPS cells. Embryonic stem cells and iPS cells are both pluripotent – they can make all the different types of cells found in the body. So the researchers needed to learn how to control these stem cells to produce one particular type of nerve cell. To do this, they took a lesson from nature: they studied how the nerve cells develop during normal development of the human brain. They then worked out how to guide stem cells in the laboratory dish through this complex series of developmental steps to produce the very specialised medium-sized spiny neurons (MSNs) that are affected in Huntington’s disease. The researchers also transplanted their lab-grown MSNs into rats with brain damage similar to that caused by Huntington’s disease. The cells survived and appeared to differentiate into more specialized neurons in the brain of the animal. The team compared the MSNs they could produce in the lab to those found in human tissue. They found that their lab-grown cells display many of the key characteristics of the naturally occurring cells. This is the first time that cells with such medium-sized spiny neurons characteristics have been produced from human pluripotent stem cells using a fully defined set of steps to take the cells through the development process, and resulting in neurons that have the characteristics of authentic MSNs from the human brain. Whilst this is a promising first indication that the cells may be useful in future treatments, the research team emphasised that much more work is needed to understand whether the transplanted MSNs will really function in the brain, whether this could lead to improvement in disease symptoms, and if so, how this might be applied to human patients. In the shorter term, the scientists believe their method provides a unique tool for studying the development of MSNs and gaining a better understanding of what goes wrong in Huntington’s disease. The lab-grown MSNs may also provide a valuable platform for testing or developing new drugs. "My work on this research was carried out as part of the EU-funded project NeuroStemcell. The possibility to be part of a research consortium such as NeuroStemcell offers a lot of opportunities. Of course, the greatest part of the work behind this recently published research paper was conducted by Alessia and me every day in the lab, through interactions, discussions and complicated experiments. But this is not the whole story. In fact, we have been very lucky to participate in Neurostemcell because the consortium created the foundation for interaction with other groups with strong expertise in other scientific fields. I had the special opportunity to collaborate and discuss with people I had never known before. Thanks to the collaboration of other researchers you can obtain outcomes much more significant than the ones you expected. Moreover, there is also another nice aspect to be considered: the incredible empathy among people (so far apart in different countries) who “suffer” when the experiments produce negative results, hope together for the decisive experiment and enjoy the feeling when your idea is definitely accepted by the scientific community."